This summer must be the year of middle-aged action heroes returning to the big screen. Arnold Schwarzenegger, the 67-year-old former governor, will reprise his role as Guardian in the fifth installment of this blockbuster film series. The film is already in theaters, just in time for the Fourth of July weekend. We didn’t think it was possible to top 2012’s Magic Mike, especially after the way Channing Tatum twerked it out to Ginuwine’s “Pony.” But in the sequel, Stephen “tWitch” Boss brings his dance moves to the stripper troupe and Jada Pinkett Smith plays the new boss. Get ready to throw your dollar bills. In theaters now (yes, that us in line already). Of course, there has to be something for the kids. Minions, a spinoff of the Despicable Me franchise, focuses on the little, yellow, pill-looking creatures who plot to find a new “despicable” master. And while this is a cartoon geared toward a young audience, from the looks of the trailer, adults will get in a couple of laughs, too. Head to the theaters July 10. (Also in 3-D!). Yes, the fifth installment of the Mission: Impossible series is on its way to theaters July 31. Tom Cruise will reprise his role as IMF Agent Ethan Hunt. Ving Rhames, who plays computer hacker Luther Sticknell in the series, is the only other actor who has appeared in all five Mission films. Fans of Michael Bae … er, B. Jordan, rejoice! The 28-year-old actor is set to star in Fantastic Four, in theaters Aug. 7. And whew, has he added a few muscles to his frame for the role? Yep! The film, based on the Marvel Comics superhero team, also stars Kate Mara, Miles Teller and Jamie Bell. It is a sci-fi film about four people who teleport to an alternate universe to save Earth. This is shaping up to be a busy year for Jordan, who is set to star in the Rocky spinoff, Creed, in November. Into biopics? Into classic hip-hop? Miss the ’90s? Straight Outta Compton, directed by F. Gary Gray and based on the story of rap group N.W.A, is definitely for you. 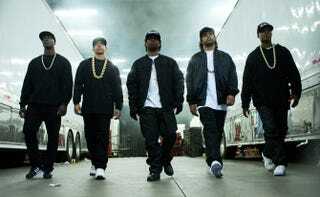 Featuring Ice Cube’s son, O’Shea Jackson Jr., and several newcomers including Jason Mitchell (Eazy-E) and Corey Hawkins (Dr. Dre), the film follows the rise and fall of the Compton, Calif., rappers. Aldis Hodge and Neil Brown round out the group as MC Ren and DJ Yella, respectively. Get ready to head to the theaters Aug. 14. Z for Zachariah is set for its theatrical release Aug. 21 after debuting at the Sundance Film Festival in January. It's a sci-fi film, an adaptation of the post-apocalyptic novel by Robert C. O'Brien about a small-town girl (Margot Robbie) who is one of three survivors of a nuclear war. Chiwetel Ejiofor and Chris Pine co-star as the two other survivors, who are both trying to be the alpha male. Erin E. Evans is a writer and editor in Brooklyn, N.Y. Follow her on Twitter.